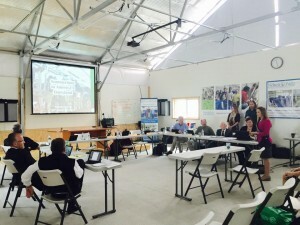 Official Meeting of WI DATCP Held at Nelson and Pade, Inc.
On Sept, 23, 2015, we were honored to host the business meeting of the Wisconsin Department of Agriculture, Trade and Consumer Protection (DATCP). 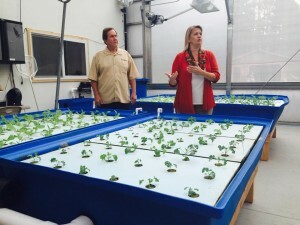 The meeting started with a tour of our aquaponic greenhouse facilities and the University of Wisconsin-Stevens Point: Aquaponics Innovation Center (UWSP-AIC). We were happy to have the opportunity to introduce the DATCP Board to aquaponic food production and Nelson and Pade, Inc. DATCP Secretary, Ben Brancel, Deputy Secretary, Jeff Lyons, and DATCP’s spokesperson, Alice in Dairyland joined the tour as well. The first stop on the tour was the UWSP-AIC. We explained the evolution of the public/private partnership between UWSP and Nelson and Pade, Inc., followed by a discussion of the related research, education and outreach efforts. In touring the six individual replicated labs, the guests were able to see, first-hand, the benefits of the partnership as well as witness the research happening. From the UWSP-AIC, we walked into our commercial production area where we demonstrate our 6-500 patented Clear Flow Aquaponic Systems® with ZDEP®. The guests were impressed with the efficiency, cleanliness and production. We answered questions about business opportunities in aquaponic food production, as well as the science, methods and operations. The final stop on the tour was our home food production greenhouse, where guests saw smaller Clear Flow Aquaponic Systems® that are ideal for families and schools to raise their own fish and vegetables, year ‘round. After the tour, the business meeting took place in our new classroom. Following the approval of the minutes from the July meeting, the public was welcome to comment on DATCP business. Numerous discussions followed, related to all aspects of the Department of Agriculture, Trade and Consumer Protection. We appreciate the opportunity to host the DATCP meeting and look forward to continued discussions about the growing aquaponics industry in Wisconsin, America’s Dairlyland.